Harvest time on Kraybill Church Road! 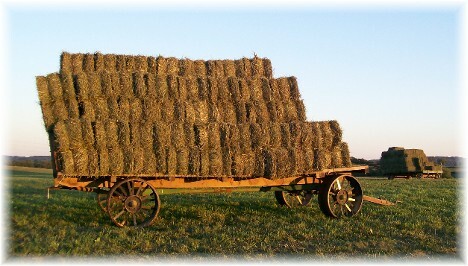 Our Amish neighbor had these wagons loaded ready for transport to the barn this weekend. See here for a larger version of this photo with Scripture verse. "I have become all things to all men so that by all possible means I might save some" (1 Corinthians 9:22). Ester was walking through with a friend when she called me on her cell phone and put me in touch with Joe Sherer, a friend who had pastored a neighboring church for many years, who is now serving a church in Elizabethtown. 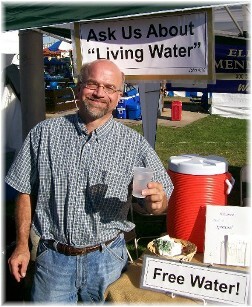 I tracked him down and saw that his church had a booth at the fair offering free water. I went over to meet Joe and we visited for a few minutes. Brooksyne joined me and then Joe offered us a cup of water. He shared with us about a serviceman he had prayed with who inquired about the "living water". Seeking to make a lasting impact Joe's church offered not only the "liquid water" that quenches the physical thirst, but they offered the "living water" that quenches the spiritual thirst for all eternity. • The incremental impact of many methods. • The incremental impact over time. • The incremental impact of many people. • The incremental impact of many circumstances. I shared today about the method Joe's church used in meeting the physical need while offering guidance for one's spiritual need. The church also provided literature as a means of sharing the gospel message. As we seek to provide a witness for Christ there are many methods that can be used but it's often the composite impact of many methods that makes the difference. In our daily text the Apostle Paul asserts his desire to reach others "by all possible means." How wonderful it is when a local church or Christian-based ministry provides a means of witness whereby others might come to truly drink of the living water, whether it happens right then and there or whether it is one of many incremental means that eventually leads to their salvation. Consider that today in regard to your faithful witness for Christ! Daily prayer: Father, we can easily become discouraged when we witness to others and see no immediate results of their coming to faith. 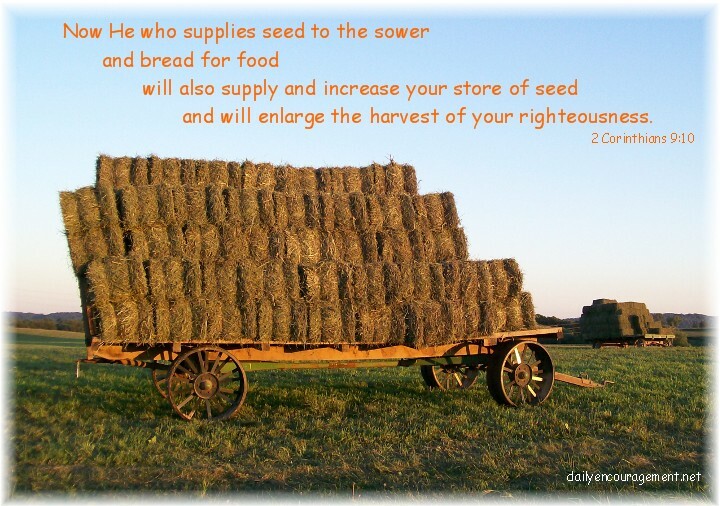 Help us to remember that we are commissioned to plant the seeds of faith and trust You for the germination and growth that comes from our sowing. There are many on our hearts today in which we have planted seeds of faith. We commit them to You and trust that You will bring other believers into their lives whereby the combination of our methods of sowing will take root and bring them to repentance and salvation in Christ. It is in the name of Jesus that we pray. Amen. 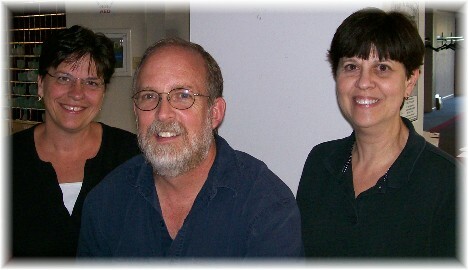 We visited with our friends Jim and Wendy Gambini who were greeters in the church where the fair displays the crafts, photography, gardening, baked goods, canning, etc. that was submitted for judging. 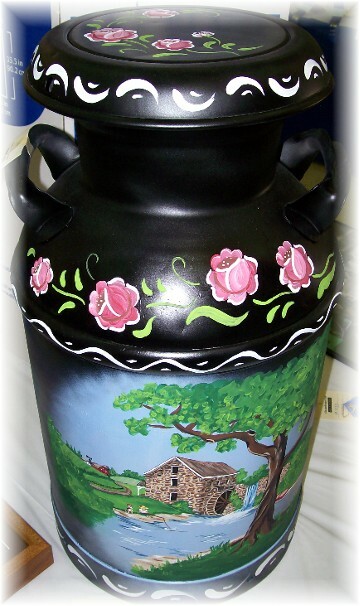 This beautifully painted milk can had a winter covered bridge scene on the other side making for dual season settings. 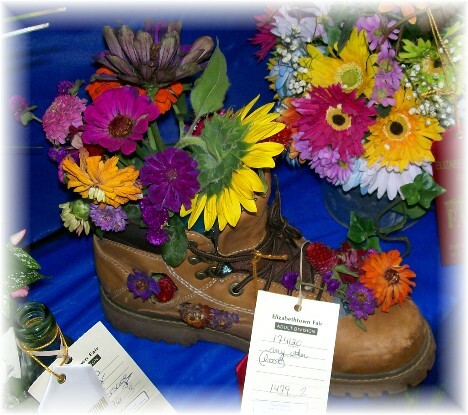 We saw all kinds of beautiful flower arrangements but I especially enjoyed this colorful use of a boot! 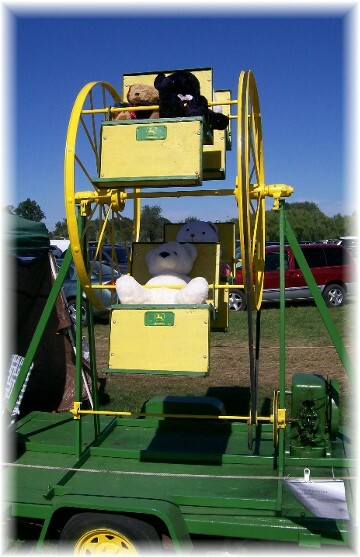 This Teddy bear ferris wheel was interesting to watch as the pulley was power generated by what I believe was a small hit and miss engine. 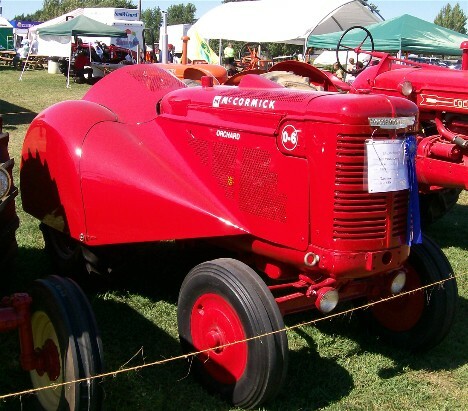 I will just show one tractor (out of many tractor photos I took). This was used in orchards. See here for more info. New feature: I am not much for publishing website statistics but sure enjoy geography. When I saw this widget that counts visitors by nation and state I thought it would be interesting to some of our readers. I installed the international widget 4/16/10 and the state widget 4/19/10 (thus the disparity in US state totals). This widget only counts visits to the main page and daily archive.